The perfect spot for your new office has a little bit of the coffee bar atmosphere mixed in with the right group of professionals furiously tapping away at their devices. There is a slight buzz in the air and someone’s mobile phone chimes making it a comfortable place to work. Add in the occasional visit from a fellow mate, and your workday is the next best thing to heaven. The coworking space is one of the few office fit outs that makes work comfortable. Designed with the idea of promoting collaboration in space where trust and respect are honoured, these little professional communities have grown worldwide, and in London, the number of spaces has risen to over 150 including Servcorp, an international provider of coworking spaces. Primarily established in urban centres, joining a Servcorp coworking space can help your business traverse the tricky business landscape, making this office style popular among professionals in the UK. Continue reading to discover how the coworking space has become a more common option to the traditional office in the UK. 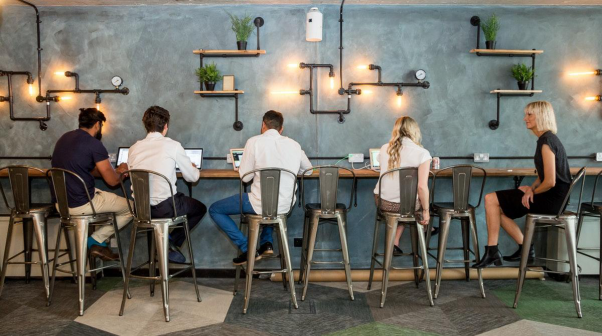 The reason coworking spaces are becoming more common is because these spaces are not just offices but they also double as a place to network and make connections with professionals from other industries. These spaces provide professionals with options to rent a hot desk or a dedicated desk in buildings in some of the finest central business districts in London. Furthermore, because the office setup is primed to encourage interaction, the coworking space provides many opportunities to relax, work, and socially engage others in the environment. Click on the link http://www.servcorp.co.uk/en/coworking/ to see how the typical coworking space might be organised. Because the workspace is designed to promote both work and networking, people find themselves falling into all types of conversations. Furthermore, coworking spaces that place emphasis on hosting social events also create opportunities for people to connect on a more personal level. Add in the more formal networking events and professionals in the space begin to gel and form a community. While traditional office spaces might not provide social cohesion, the coworking community is one that defines itself, making each one unique from others. More significantly, the sense of community tears down the barriers that create insecurity, and worse yet, competition. This is primarily why people often join a coworking space as opposed to just renting an office. Another reason professionals are trading in office space for the coworking space is because the coworking space is rife with opportunities to find and meet mentors. Because the space is filled with professionals and businesses from a variety of industries, your business can engage with people from a variety of fields to make valuable relationships that can help in navigating the UK’s ever-changing business landscape. Also, these mentors can be a source of information and a resource for getting referrals. All of these features culminate in your business having opportunities to team build and collaborate with members of the coworking community. These collaborations are important because they present businesses with the chance to raise their businesses profile while also encouraging business growth. Essentially, the coworking space and the collaborations that come from it provide your business with a platform on the business landscape. The coworking space is in many ways like a family. The large ones are made up of lots of people who can be noisy, in your face, and just all around pushy. However, this family that makes up your community also offers a lot of support in helping you make connections and transition your business plan from a fledgeling startup to an established business. The coworking space is more than a workspace. It is an investment.